The temple represents a three-level pyramid oriented to the west. Despite quite a complex structure, it was built from the centre to the periphery. No matter which side you look at it from, only three of its five towers are visible, and this is an architectural miracle still nowadays. 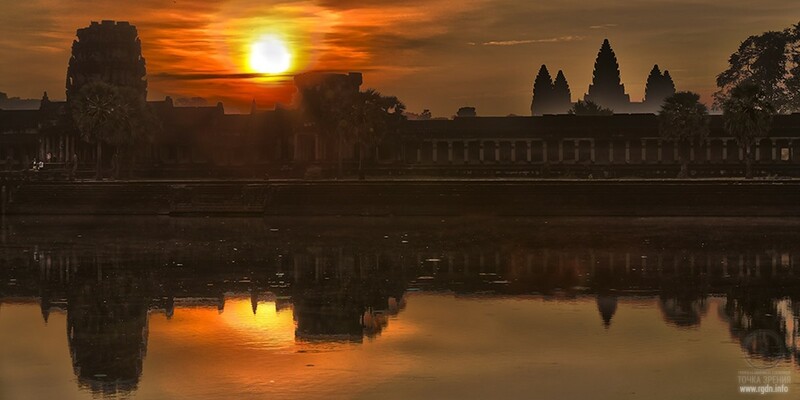 According to Khmer beliefs, three levels of the temple symbolize the three elements: air, earth and water. 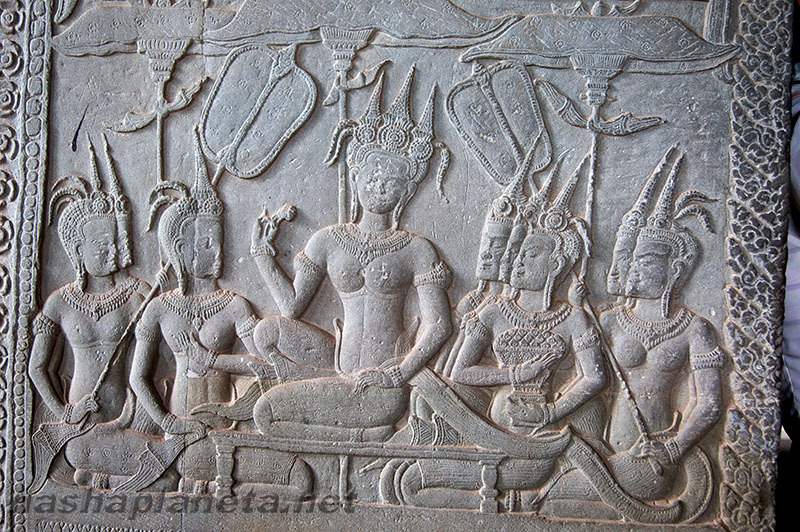 Based on the acquired knowledge and logical comparison of relevant information we can assume Angkor Wat did not serve as a place for believer gatherings or divine services, but was “the abode of Gods”. Furthermore, it was the burial place for kings. 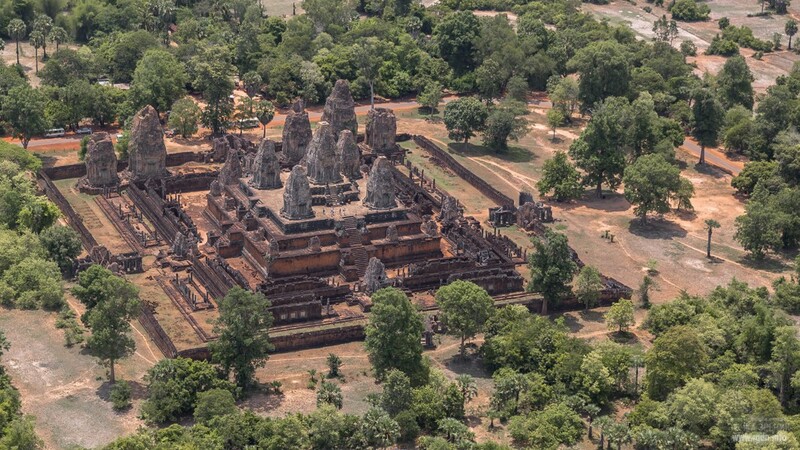 The temple represents a rectangular building of 1500*1300 m. Round the temple there is a 190-m-wide moat. The complex consists of an external yard with three concentric structures (the temple itself) built inside it. The entrance is on the western side. On the entrance side, a long road is laid between the tower and the temple. 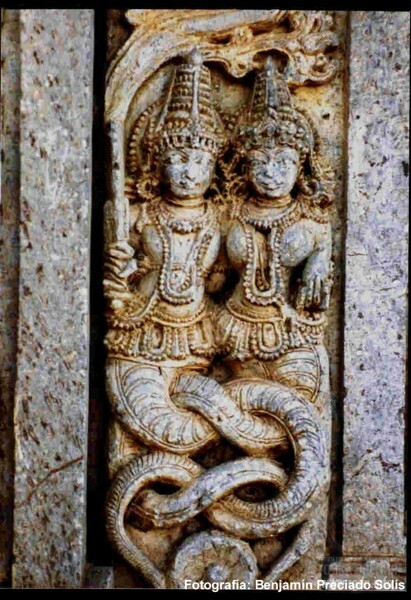 On the right and left sides of the road there are sculptures of serpents with seven heads (! ), resembling guards. Doesn’t this remind of the Chinvat Bridge that we are already familiar with? The temple architecture matches its sculptural decoration which plays an important role here. 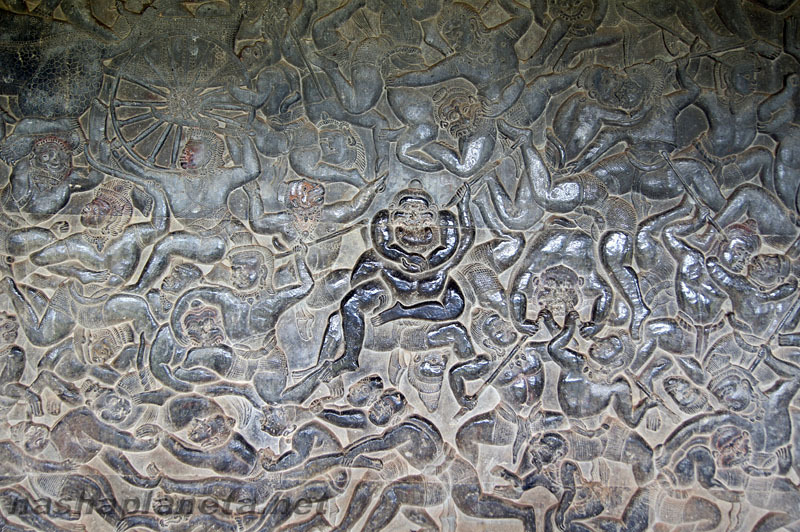 Bas-reliefs with mythological scenes are made on all three levels of the temple. Three towers are located before the entrance to the first level having dimensions of 215 x 187 m. Here, there are numerous frescoes and friezes depicting Hindu myths. All in all, there are eight giant bas-relief friezes in the first level gallery, the height of which is 2 m and the total length is about 1,000 m. Scenes on the bas-relief friezes depict major episodes of popular Hindu eposes Ramayana and Mahabharata. On the internal side of the gallery, there is a blank wall on which the bas-reliefs are in particular, whereas on the external side there is a double row of columns that form a rather narrow passageway to observe the bas-reliefs. The ceiling is decorated with fretwork reminding of the lotus flower. 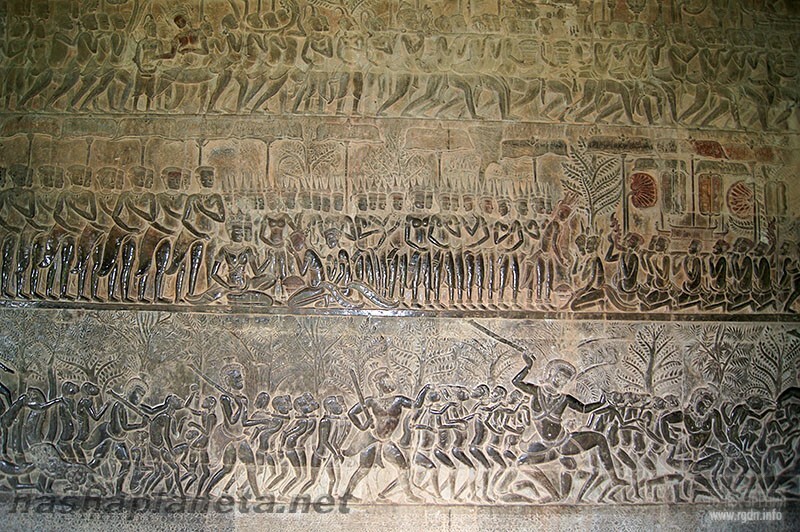 Eight huge stone bas-relief friezes on the first level depict such celebrated scenes as the Churning of the Ocean of Milk, the Battle of Kurukshetra, etc., while their total area makes up 1,200 m². The second level of the temple has dimensions of 100 x 115 metres. One can get there, walking from the first level through the central entrance along sheltered corridors (from the west to the east). The three over-gate towers of the central entrance are connected with the three towers of the second level by peculiar corridors. 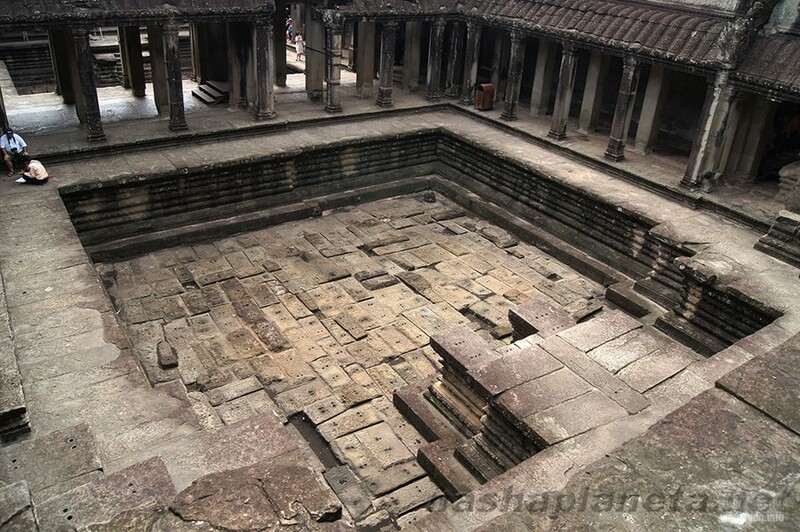 The formed inner space is divided into four rectangular courtyards that were turning into artificial pools during the rainy season. On the second level, on the right and on the left there are library buildings, each having four entrances, and the central stairway leading to the temple third level. Ten entrances are located here, each decorated with an improvised roof. Galleries of the second level are represented by corridors. One part of the wall (on the external side) is blind, while the other part (on the inner side) has windows with short figured columns serving as window grates. The corridors open to the internal part of the yard with a double row of pillars making up covered galleries of about 3 m width. 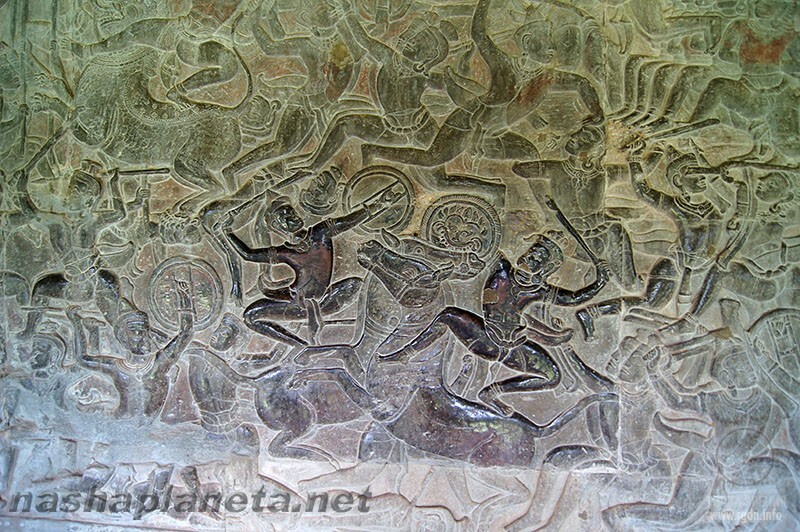 Gallery bas-reliefs depict some two thousand Apsaras, none of which is similar to the others. 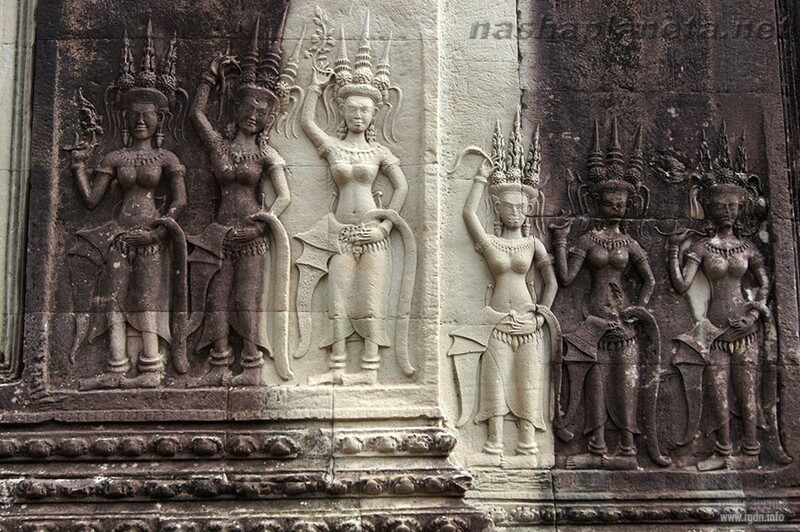 Walls of the second level are decorated with about 2,000 figures of heavenly virgins – Apsaras. The third level has dimensions of 75 x 75 m and is located 25 m above the ground, whereas the total height of the central tower is 65 m from the ground. The third level space is split into four squares representing courtyards, from where one can ascend both to the corner towers and main towers. 12 stairways with very big stairs lead to the towers. The towers are connected with each other by roomy corridors. From the central tower four galleries open on both sides branch, each one 15 m long. On one side (inwards) a double row of pillars is located, on the other side (outwards) there are windows with grates made of figured columns. 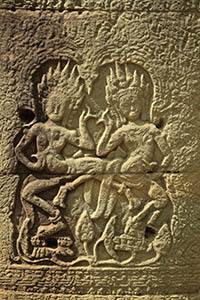 Bas-reliefs here are decorated with fretwork depicting demigods (Devatas). The central tower looks particularly regally, if you look at it either early in the morning from the foot of the northeast tower, or at sunset from the foot of the northwest tower. A marvellous view of the vicinity opens up from the third level height. The temple outer wall has dimensions of 1024 x 802 metres and the height of 4.5 metres, being surrounded with a 190-metre-wide moat. To the east of the temple there is an embankment. From the west one can get to the temple along a levee made of sandstone. The western gate is the main temple entrance, where in the past there was a wooden bridge instead of the levee. For each cardinal direction there is an over-gate tower serving as an entrance to the temple complex. Correspondingly, the western entrance (horupa) is the largest one and consists of three towers now ruined. 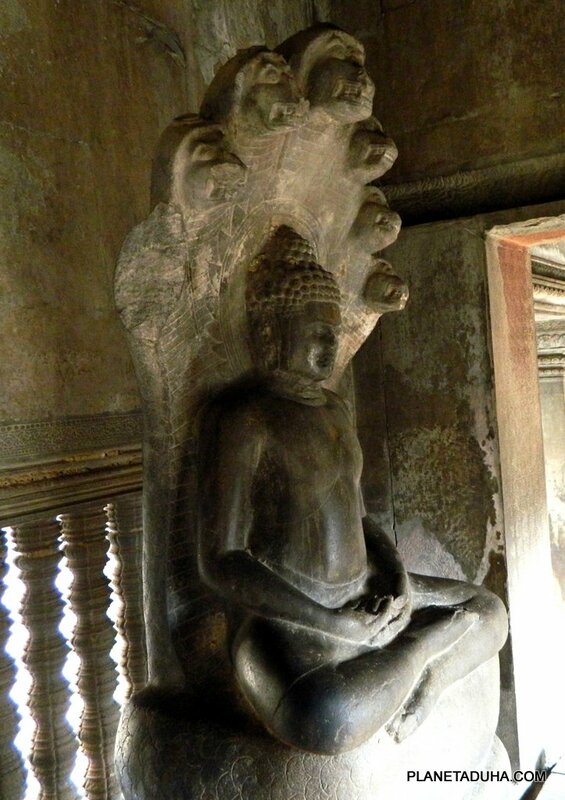 Maurice Glaize who was Angkor Wat conservator in 1937-1945 mentions this horupa simultaneously hides the complex from the one who enters it and resembles the entire complex. A Vishnu statue known as Ta Reach is located under the southern tower. Possibly, it was initially situated in the central part of the temple. The towers are connected by galleries that have a solid wall on the inner side and square pillars on the outer side. The galleries are spacious enough for elephants to walk along them, while horupa entrances are often called “the elephant gates”. The ceiling between the pillars is decorated with lotus-shaped rosettes, the wall western façade is decorated with dancing figures, and the eastern façade with balustrade windows, figures of men dancing on backs of galloping animals, and Devatas. 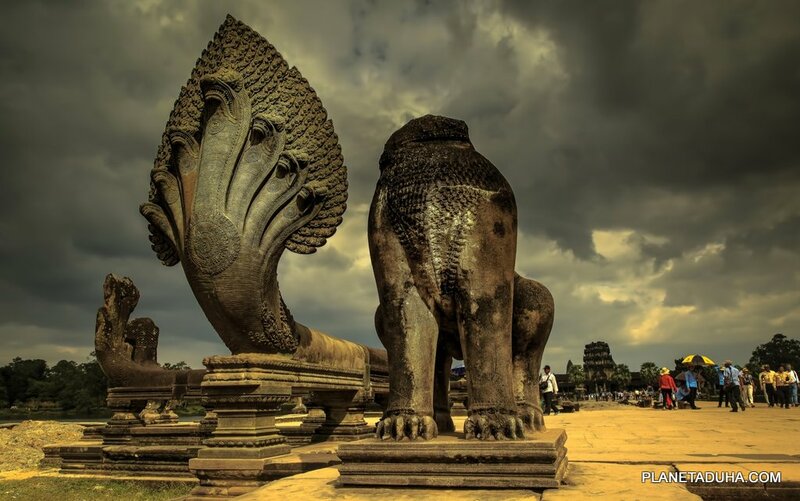 The outer wall envelopes the area of 820 thousand square metres (203 acres), which was initially occupied by not only the temple, but also city buildings and the royal palace to the north. 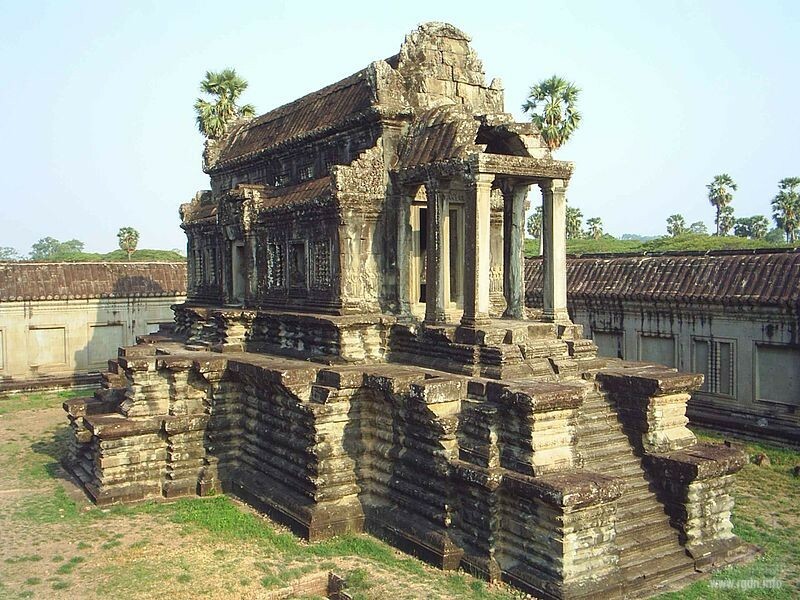 Just like all other mundane buildings of Angkor, these buildings were constructed of short-lived materials (as distinct from the temple stone structures), and so almost nothing remained of them, except contours of several streets. 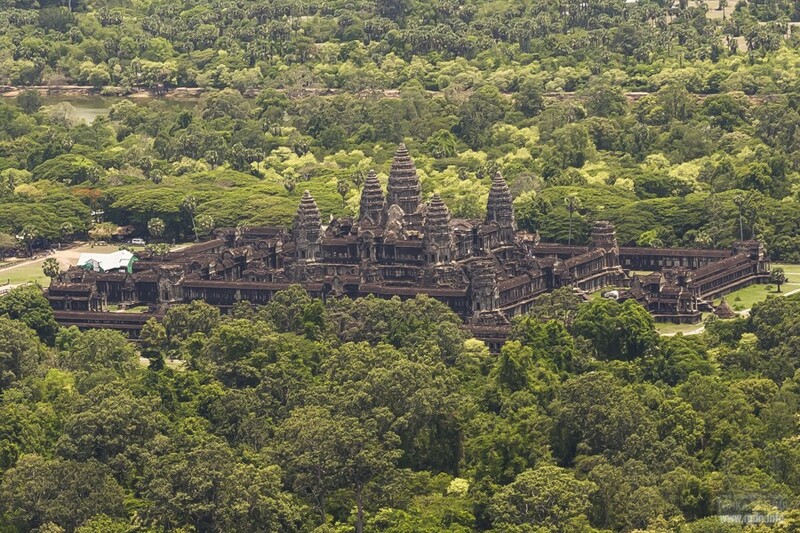 A major part of the area around the temple is now covered with forests. 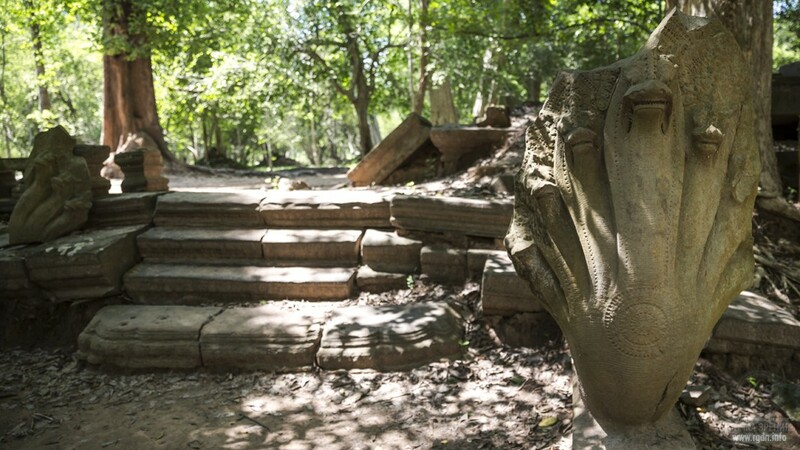 The western horupa and the temple are connected by a 350-metre-long stone road (platform) with a balustrade of Nagi figures. The road has six descents to the city on each side. On both sides of the road there are so-called “libraries” located opposite the third stairway (if we count from the temple). Ponds are between the libraries and the temple. 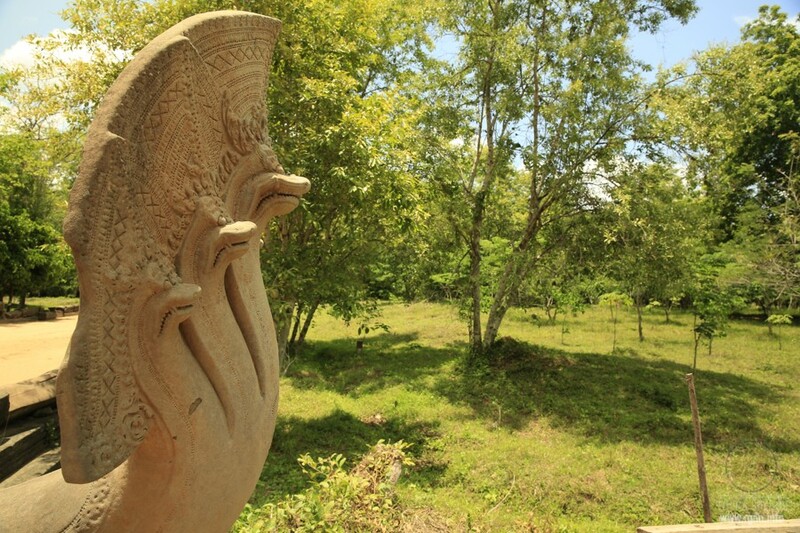 The ponds are not original elements of the temple complex; they were added later, just like the cruciform terrace “guarded” by lion figures and connecting the stone road with the temple centre. Finally, let’s touch upon the sacral number 72, for there are too many "accidental" coincidences. In view of the Primordial Knowledge brought by Rigden Djappo to the world and given in the AllatRa book, it finally becomes clear what it’s all about. 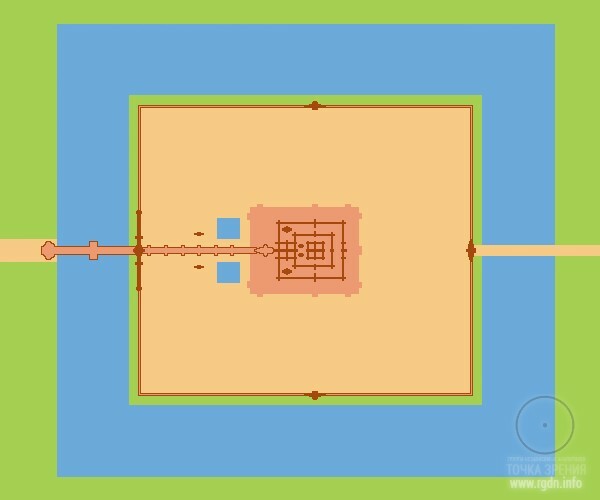 The Great Pyramids of Giza are located at longitude 31.15 east, ancient Heliopolis was at longitude 31.2 east, and Angkor Wat complex is situated at longitude 103.5 east. That is, the distance between Giza sacred land (Heliopolis), where sages ruled who followed the astronomical “road of Horus”, and the holy site of Angkor the name of which literally means “where god Horus lives”, approximately makes up a geodetically significant value of 72 degrees of longitude (103° – 31° = 72°). 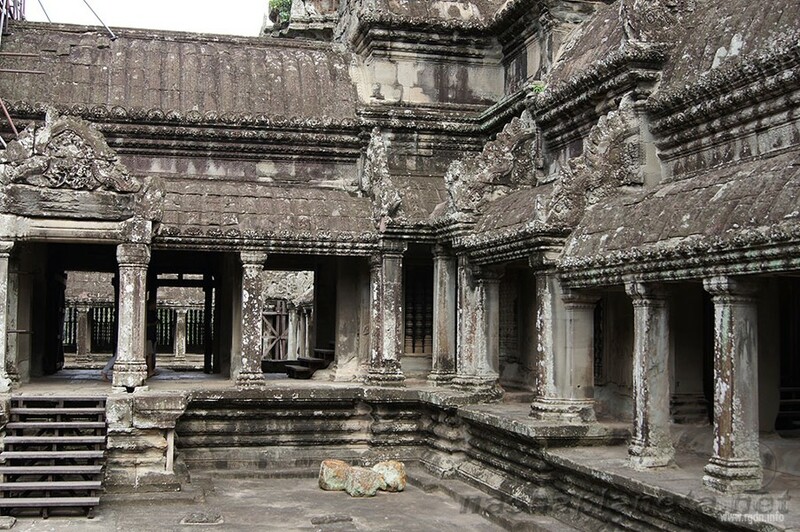 All in all, there are 72 major stone and brick temples and monuments in Angkor. 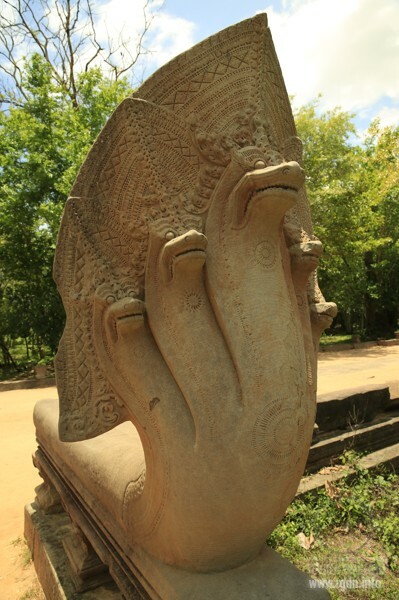 The Khmer alphabet includes 72 letters and the same number of sounds. 72 is considered to be a sacral number in many religions. In ancient Sanskrit (the language of classical Hindu literature, scriptures, mantras and rituals of Hinduism, Jainism and partially Buddhism) the Devanagari alphabet is used. Devanagari means “the written language of Gods” or the “urban language”, and Devanagari of classical Sanskrit consists of 36 letters-phonemes (72:2=36). In Devanagari, 72 main ligatures (consonant combinations depicted by independent symbols) are used. The most ancient runic system, the so-called Elder Futhark consists of 24 runes, each of which can signify a letter, a syllable, or word, or an image. At that, images have a priority meaning. Up to three images can be hidden in one rune depending on the context (24х3=72). And all such images are related one way or another. The ancient runic alphabet became root for all currently existing Indo-European alphabets. The 24 runes known today is just a third of the genuine language, because, if we multiply 24 by 3, we get exactly 72 runes. And the ancients taught the world was three-compound. One is the earthly world Getig, the other one is the intermediate world Ritag, whereas the third one is the supreme world Menog. And so there are three rune forms. In the ancient Avestan (the language of Avesta, the sacred book of Mazdaism) there were 72 letters to designate all possible variants of sounds pronunciation. The most important Avesta book Yasna represents a text read at the main Zoroastrian service Yasna and containing 72 chapters. In Sanskrit and initial Avesta the number 72 was manifested in the 72 threads of the sacred Kushti belt possessed by every Zoroastrian as a symbol of adhesion to the religion, or rather a “navel string” connecting a person with God. In Judaism, the number 72 is considered sacred and is inseparably linked with God’s name, the forbidden name which can manage and control the entire universe. There are 72 letter sequences in the Hebrew alphabet, and a certain sound corresponds to each letter. 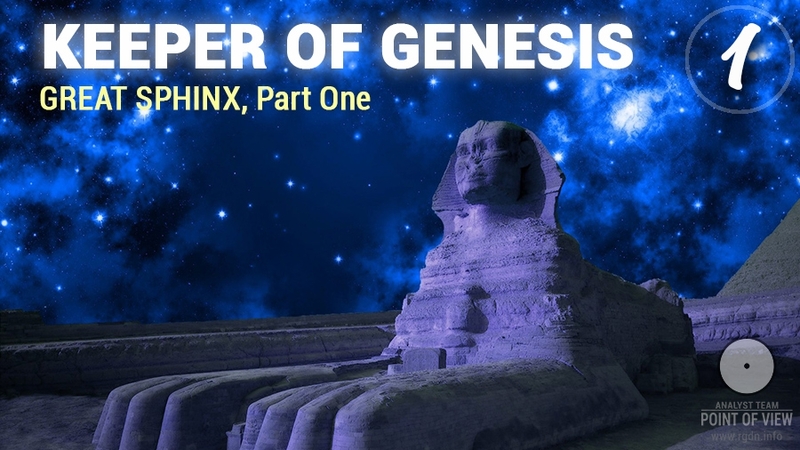 The sequences possess a striking power of overcoming natural laws in all forms, including the human nature. 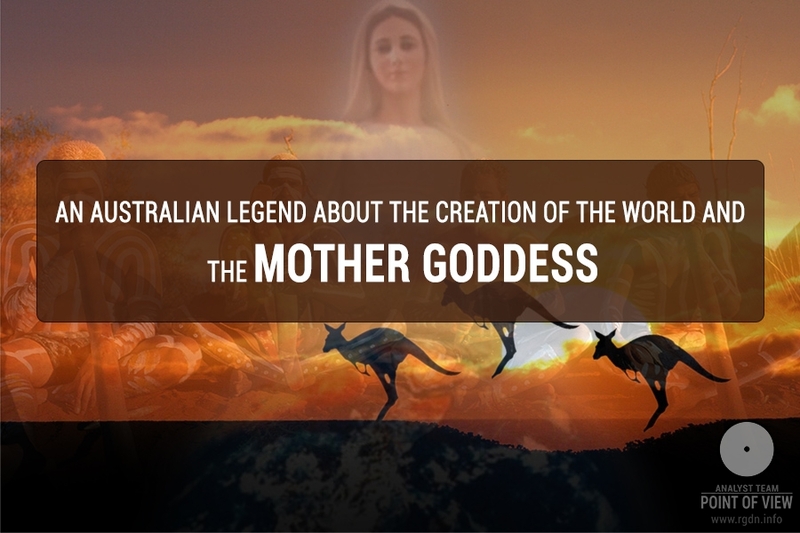 Legend says, God’s name contains all the existing, and the one who can pronounce it correctly will be able to ask the Creator for anything he or she desires. The unutterable name of God was the main subject of studies performed by medieval cabbalists. 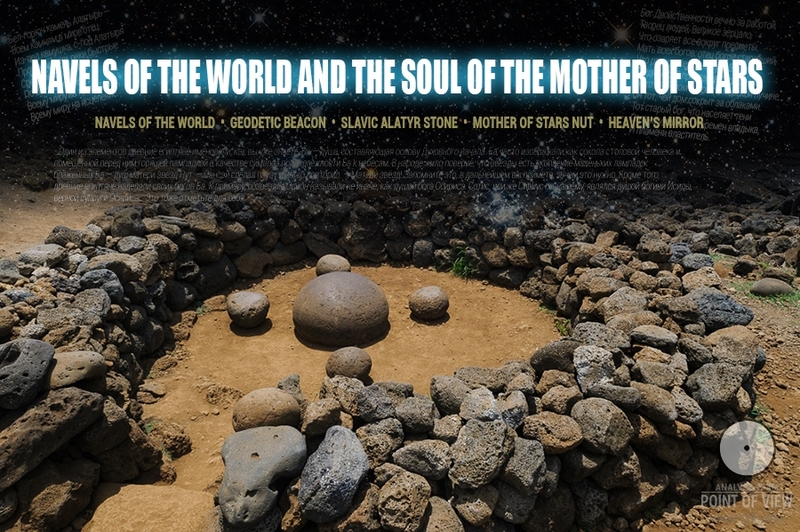 It was considered this name contained all powers of nature and the very essence of the universe. God’s name is also depicted in tetragrammaton – a triangle with letters inscribed in it. If we sum up the numerical values of letters placed in tetragrammaton, we’ll get 72. In the legend of Sanctuary (Temple) ancient Jews mention 72 almond buds with which they decorated the candelabrum used in sacred rituals, representing a combination of 12 and 6 (i.e. the half of 12) and embodying the implemented harmony. The mystic root of the number 72 is also the legendary nine. Attentively examining the images herein, it’s impossible not to notice the number 7 as well. 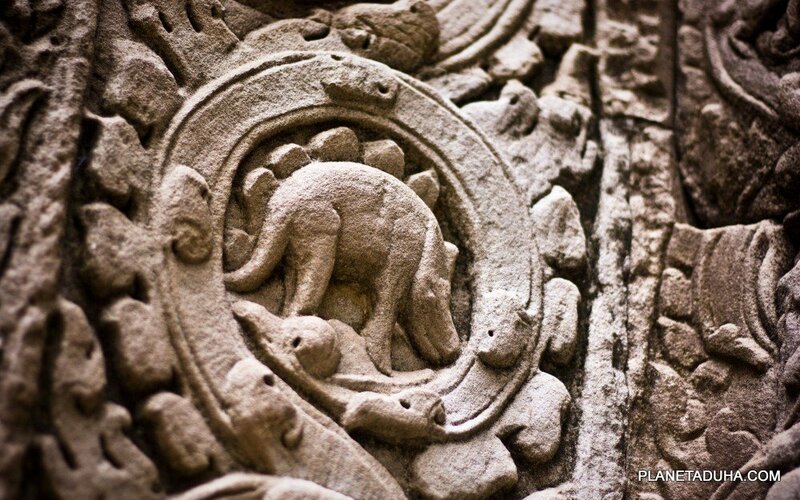 Allusions to the seven dimensions are available not just in Angkor Wat temple buildings, but also in the state symbols of Cambodia. 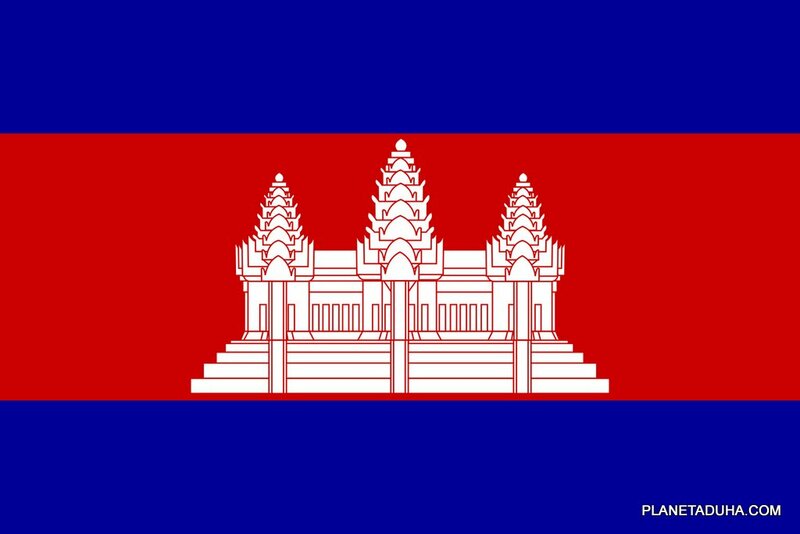 The central part of the Angkor Wat temple complex is the main symbol on the Cambodian state flag. At the ancient building contour we see three towers, each of which consists of seven “cupolas”. On one of stone frescoes we’ve discovered a figure of a dinosaur-like animal with six “combs”. It may be interpreted as embodiment of the Animal Mind, material system or septon field possessing power over six dimensions only. 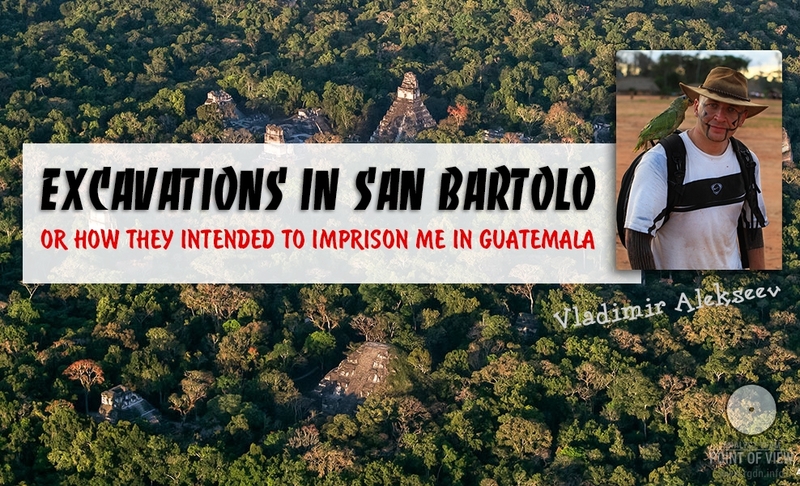 However, in one of our nearest articles we shall go back to this marvellous ancient sacred place in order to publish a series of unique photographs of frescoes, bas-relief friezes and sacred architecture. 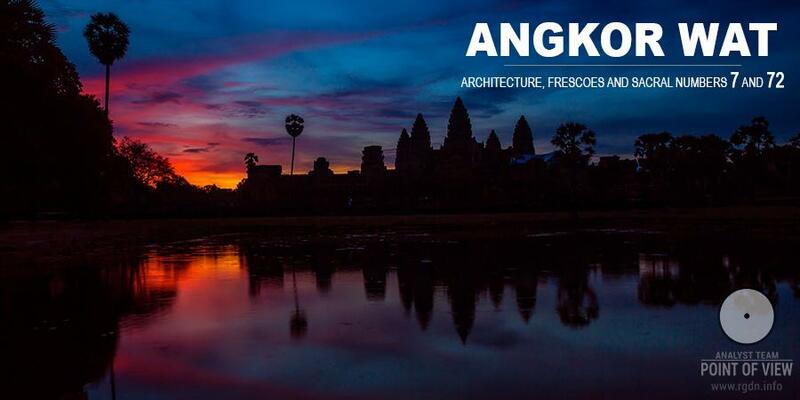 The images were made by a professional photographer who visited Angkor not so long ago and kindly agreed to provide us with such material. Stay with us and follow our publications.